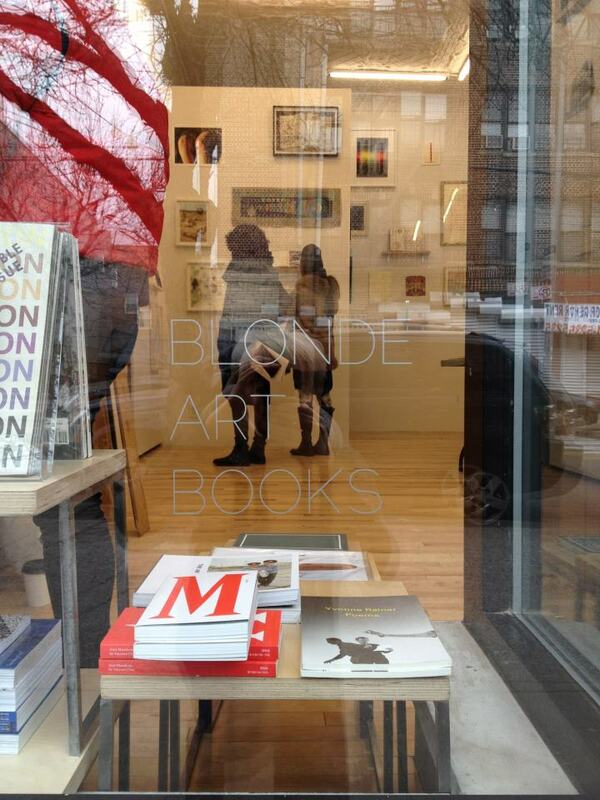 BLONDE ART BOOKS is a blog, curatorial project, and bookstore focusing on independent publications by artists and small art and poetry presses. Sonel Breslav started the project in 2012. This summer she has been on the road with the project, organizing events across the country, from The Mattress Factory, to the ICA in Philadelphia, to The Wexner Center in Columbus; Blonde Art Books has passed or will pass through such cities as Washington, DC, Baltimore, Detroit and more in order to exchange ideas and local knowledge about independent publishing networks. At each stop Breslav has organized a unique set of discussions and events with other independent publishers, artist book makers and bibliophiles. This Thursday, the 18th of July, she comes to Chicago’s Hyde Park Art Center. From 7 to 9 pm, she will present a table of art books and zines in the BAB collection alongside local authors and publishers Cassandra Troyan, Soberscove, Ezra Daniels, Lumpen, and Temporary Services’ Half Letter Press. Guests are invited to bring 1-2 copies of their own favorite, artsy/independent books to participate in an informal show and tell. As a publisher myself, and because I love independent, small run print projects, because I love the way that material books must now justify themselves in the face of digital publishing strategies, because that material justification makes the book infinitely more interesting, as publishers and authors alike push and pull against the boundaries of conventional book making—for those reasons and more, I wanted to ask Breslav about the origin and agenda of BAB. Caroline Picard: How did Blonde Art Books Start? Sonel Breslav: I was assistant director of an emerging artist gallery in Chelsea for four years and learned everything about organizing exhibitions. I’ve curated independently as well as helped design & build sets and art installations, functioned in a managerial role in artist studios, and generally worked with artists in many different capacities to help produce diverse projects. A little over a year ago I started focusing on exhibiting artwork and books side by side and creating a space in which books inform and expand upon curatorial intent. I am interested in the DIY aspects of publishing and I think about art books as an extension of art works. Not a tool to understand art rather another medium that seems to have endless possibilities. I am playing with this idea by going on tour with Blonde Art Books. The tour allows me to share the books that I have curated into exhibitions, written about on my blog and sold out of my shop in Brooklyn. I am physically bringing the books to a new audience that may otherwise not have access to them. 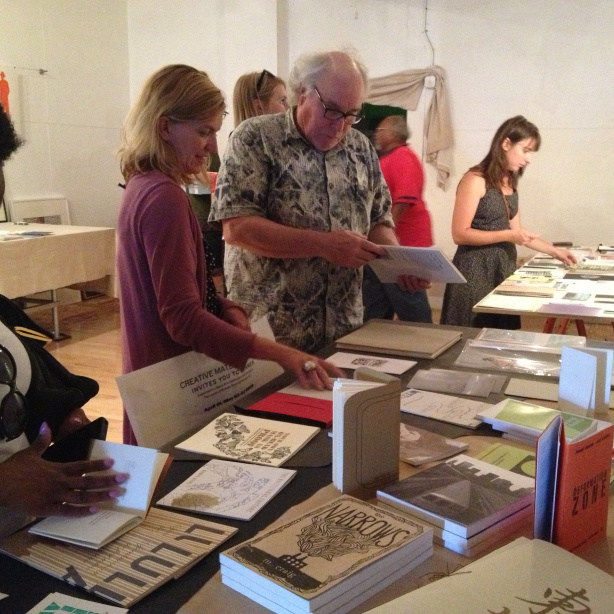 In turn I am gaining insight into print and self-publishing culture in cities outside of New York. CP: You recently took up residence at a gallery in Brooklyn, Schema Projects. How did that relationship unfold? SB: I met Mary Judge, the owner of Schema Projects (a new art gallery in Bushwick which focuses on works on paper), at a pop up event during Bushwick Open Studios 2012. She was interested in BABS and I was interested in experimenting with the book-centric exhibition model. Have a shop also allowed me to have a more permanent place for the growing inventory. Until January BABS was housed in the living room of my apartment. From its origin I’ve been thinking about the project in relation to a museum bookstore – on a much smaller scale of course. Publications made about and by the artist currently on view in the gallery space in the mix with books by other artists as well as ones that related to the history and criticism of the curatorial intent. For example: I organized a show at Schema Projects in March titled ‘The scenery changes three times’. The show featured four artists who work with collage, photo-montage, and surrealist abstraction. There was a commonality that I found between the works that I thought about it terms of myth, folk-lore, and storytelling. I asked each artist to make a limited edition chapbook series based on the works in the show. It was a bold request considering some of the artists had never crafted books by hand before. We offered binding workshops for the artists and there were many discussions around the connections that I was trying to make between the artists’ work and the tradition of chapbooks – some of the first modes of disseminating politics, ballads, and stories. The books were displayed in the shop on the main shelf and was surrounded by other art books (comics, graphic novels, zines, and poetry)that had material and content driven similarities. CP: While keeping your foothold in NY, you’ve also been on tour through the country, sharing your inventory with new audiences. Can you talk a little bit about what that’s been like? SB: Each day I am meeting new people that are setting plans to open up their own art bookstores, they are part of a DIY publishing collectives, or in the process of making their first book. Each event is very different from the next. We have been hosted by museums, galleries, print shops, and music venues. Its important that the venues have been so diverse because I think it reflects the fluidity and accessibility of art books and printed matter. For each event local publishers and artists are invited to bring their projects and share them by displaying alongside the traveling BABS collection. In some cases we’ve done readings and short informal presentations during the events ie. the event at Nudashank in Baltimore there were readings by Alejandro Ventura and Lesser Gonzales and just the other day at Salt & Cedar in Detroit, Maia Assaq presented new projects and upcoming projects by DittoDitto. I’ve been surprised over and over by the generosity and ambition of writers and artists in each city. I had an especially eye-opening experience in Pittsburgh where I worked with Spaces Corners, Jasdeep Khaira who runs Encyclopedia Destructica and Flight School, and Daniel McCloskey of Cyberpunk Apocalypse. CP: What are some of the books you’ve brought with you on the road? SB: I am traveling with books that I have written about on my blog, curated into an exhibition or featured in the bookshop. Most are small and zine-like because they are easiest to carry. Other materials include documentation about my past projects and information about upcoming opportunities related to publishing such as book fairs, and open calls. A lot of people are surprised by the tour, they like to call it the BABSmobile, or Artbook Roadshow. In general I am investigating modes of distribution of art books and I’m not sure I could do that without going ‘on the road’ with these books. I guess the tour is kind of punk or DIY or whatever you want to call it—but it seem like a very simple idea to me. I have these great things that I think more people need to see and I am trying to figure out how to make that happen. Its really important that I meet all of the people I am meeting and learn about their projects and try to understand what fuels their community of book-makers. The Hyde Park Art Center is located at 5020 S. Cornell Avenue Chicago, IL 60615. Our first extensive interview – Many thanks to Caroline Picard and Anobium.